They say that admitting that you have a problem is the first step on the road to recovery. One of my recurring problems is that when my wife asks me to get an item out of the fridge I cannot find it. When I report that the item in question is not there, nine times out of ten she will walk over and pull it out without even having to search. Usually when this happens, the item was sitting at the front of the shelf —and at eye-level to boot—hiding in plain sight. As I continue to prepare the ANS Seleucid coin database for the Seleucid Coins Online project it has become increasingly clear that previously unpublished coins—both control varieties and types—have also been hiding in plain sight in the Society’s trays for decades, despite the close attention of many specialists over the years. It is only now that almost the entirety of the Seleucid collection has been photographed and the images associated with the MANTIS database entries that these new coins have been revealed. The new discoveries in the trays mirror the general state of Seleucid numismatics, which has seen new types and control varieties appear at a remarkable pace in commerce over the years. Since Seleucid Coins, Part 2 was published jointly by the American Numismatic Society and Classical Numismatic Group in 2008, hundreds of previously unknown coins have been recorded. The purpose of this post is to introduce a few of the interesting new Seleucid discoveries in the ANS cabinet. Figure 1: Alexandrine tetradrachm (ANS 1944.100.77077). Perhaps the most intriguing of the coins is the Alexandrine tetradrachm from the bequest of E. T. Newell accessioned as ANS 1944.100.77077 (Fig. 1). Based on the original database entry, Newell considered this coin to belong to an oft-discussed series of tetradrachms struck under Seleucus I Nicator (312–280 BC) frequently bearing an anchor symbol and which he attributed to the north Phoenician mint of Marathus. The Marathus anchor Alexanders were subsequently reattributed as a whole to neighboring Aradus in 1998 before closer analysis of the historical and hoard evidence permitted the identification of their true origin at a mint in Babylonia (Uncertain Mint 6A in Seleucid Coins, Part 1) in 2002. Despite the interest in sorting out this Alexandrine series, neither Martin Price, Arthur Houghton, myself (when I was reviewing the trays for SC 1 in 1999–2000), nor anyone else seems to have noticed this coin and therefore it does not appear in the pages of The Coinage in the Name of Alexander the Great and Philip Arrhidaeus (1991) or Seleucid Coins, Part 1 (2002). It continued to be overlooked as late as 2015, when the American Journal of Numismatics published a new study of Uncertain Mint 6A by Lloyd Taylor. Figure 2: Anchor Alexander, uncertain Mint 6A (Newell’s Marathus) (SC C67.5a, see CNG Electronic Auction 376, lot 237). Artistic style and the monogram in the left field of the new coin indicate production at Uncertain Mint 6A (Newell’s Marathus). Indeed, the obverse die seems to have been cut by the same hand as a die employed for that mint’s anchor Alexanders (SC C67.5a, see CNG Electronic Auction 376, lot 237; Fig. 2). However, the wreath around the left field monogram and the bee symbol below it also suggests a degree of influence from the so-called “Imperial Workshop” of Babylon (SC 82.2b; Fig. 3)—now thought to have coined Alexander tetradrachms for Seleucus’ arch-enemy, Antigonus the One-Eyed, during his occupation of Babylonia (315-308 BC). Figure 3: Alexandrine tetradrachm of Babylon I, the “Imperial Workshop” (ANS 1944.100.80957). With the exception of the anchor, field symbols are otherwise unknown at Mint 6A and the mint is already known to share a wreathed monogram with the “Imperial Workshop” (SC 67.5a and SC 81–85). While the obverse die seems to belong to Taylor’s Series II, which he dates to c. 306–304 BC, the treatment of Zeus and the absence of an anchor symbol connect the new coin to Taylor’s Series III, which he dates to 304–303 BC. The possibility of influence from the “Imperial Workshop” of Babylon will require further study and may perhaps demand revisiting and revision to the Marathus/Aradus/Uncertain Mint 6A complex of Seleucus’ Alexandrine tetradrachms yet again. And to think that the coin has been sitting in the cabinet since the mid-1940s! Figure 4: Unpublished bronze coin of Seleucus II Callinicus (246–226 BC) from an uncertain mint (ANS 1982.175.9). Somewhat less embarrassingly old is a previously unknown bronze coin of Seleucus II Callinicus (246–226 BC) accessioned as ANS 1982.175.9 (Fig. 4). It has only been overlooked in the trays since 1982. The denomination (B) and types are very similar to a series struck at a Syrian mint formerly identified as Apamea, but now known as the uncertain ΔEΛ Mint (SC 706; Fig. 5). However, while both the new coin and the ΔEΛ Mint issues feature a bull butting left on the reverse, the latter carries a depiction of Seleucid dynastic god, Apollo, on the obverse. The new coin features the diademed portrait of the king instead of Apollo, but this fact went unrecognized by the original database cataloguer and by anyone who has seen it over the last several decades. The coin is not listed in Seleucid Coins Part 1. Based on the reverse type, the coin may be a new issue of the ΔEΛ Mint, but in the absence of any visible control monograms this attribution must remain tentative. The type combination of the head of Apollo and a bull butting right also occurs on bronze denomination A at Seleucia on the Tigris (SC 773). Figure 5: Bronze denomination B of Seleucus II Callinicus (246–226 BC) struck at the ΔEΛ Mint (ANS 1944.100.77000). 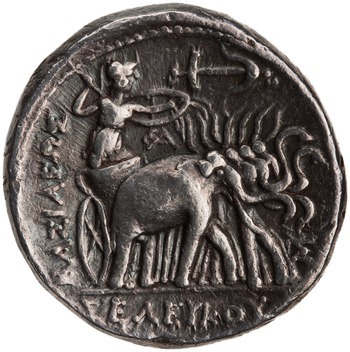 A third discovery is not overly embarrassing and does not really expand our knowledge of Seleucid numismatics, but it is rather fun. The cut fraction of a gold stater (Fig. 6) accessioned as ANS 1997.92.1 has been carried in the database for two decades now as a Bactrian issue of Antiochus II Theos (261–246 BC), apparently based only on the limited remains of the portrait. Only the royal title BAΣΙΛΕΩΣ remains on the reverse. However, close analysis of the reverse shows the small tip of a thunderbolt above the legend, which can only mean that the coin was struck under the rogue Seleucid satraps of Bactria, Diodotus I and Diodotus II. Although early Diodotid staters struck at a facility designated “Mint A” did include a legend naming their distant monarch, Antiochus II, the positioning of the thunderbolt here points to production at “Mint B,” which did not employ a legend naming the Seleucid king on staters (Fig. 7). Therefore, the cut stater given to Antiochus II is not a proper Seleucid coin at all, but rather an issue struck by the Diodoti after they claimed full autonomy from the Seleucid Empire in c. 255 or c. 246 BC. Figure 6: Cut fraction of a gold stater originally attributed to Antiochus II (ANS 1997.92.1). These three discoveries are not the only ones made while working through the database, but are among the most interesting to date. They are exciting because they show that there are still new things lurking in the ANS Seleucid trays waiting to be revealed. The long time that some of these coins have lain in the cabinet unrecognized for what they are despite the number of eyes that must have fallen upon them is also comforting. Clearly I am not the only one who cannot see what is in plain view at the front of the fridge. Figure 7: Diodotid gold stater of “Mint B” (ANS 1980.109.108).